If you get to Philadelphia any time soon, stop by Art in the Age. Formally known as "Art in the Age of Mechanical Reproduction," it is a small artisan shop in the Old City neighborhood that is filled with temptations (think Ace & Jig, MCMC Fragrances, Field Notes, and the Hill-Side). 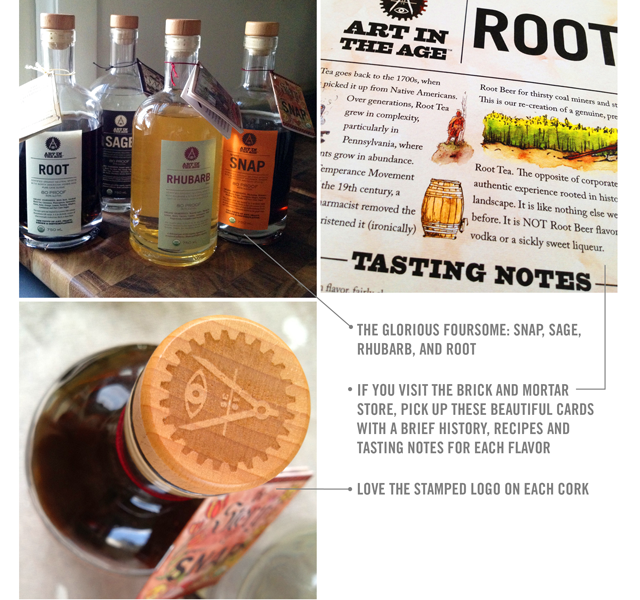 But what really won us over is their organic, craft spirits: Root, Snap, Sage and Rhubarb. The flavors are fabulously unique and each one has a clever story behind it. Visit their website to learn more and peruse their cocktail recipes.